All you need to do is enter you email address in the "Follow By Email" box located on the top of the right side column. Every time there is a new blog entry, you will be notified by email! Take advantage of the feature and stay informed! Annual Bluegrass Weevil Adults Already? 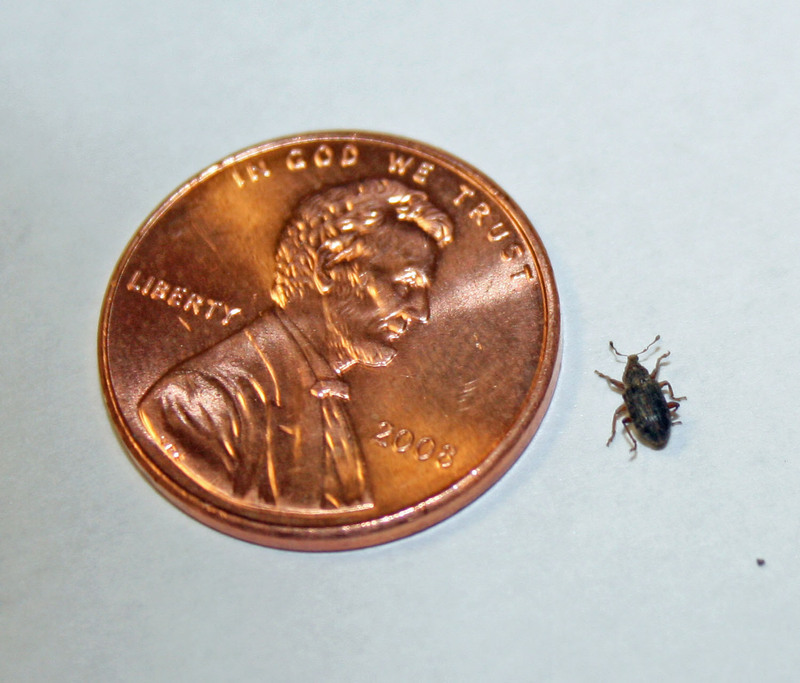 The Annual Bluegrass Weevil is a common pest on golf courses in the northern states. We at The Farms Country Club see damage of varying degrees on a yearly basis due to our high population of Poa Annua (Annual Bluegrass). We have become quite good at controlling this pest through our regimented scouting, varied control methods, experience and the continual pursuit of the latest research results. Still, are we good enough? We have already employed a new method of scouting for the adults this year. Adults primarily “overwinter” in wooded areas and make their way to our fairways tees and greens where damage is most obvious. Adults lay their eggs in plant stems (sheaths) and the larvae that hatch actually do the most damage to the Poa. In an effort to see exactly when the adults are traveling to the fine turf areas, we decided to fabricate our own pitfall traps. The traps are very basic in design and are simply constructed with some 2” PVC pipe, a 2 liter soda bottle and some duct tape. MacGyver would be proud! 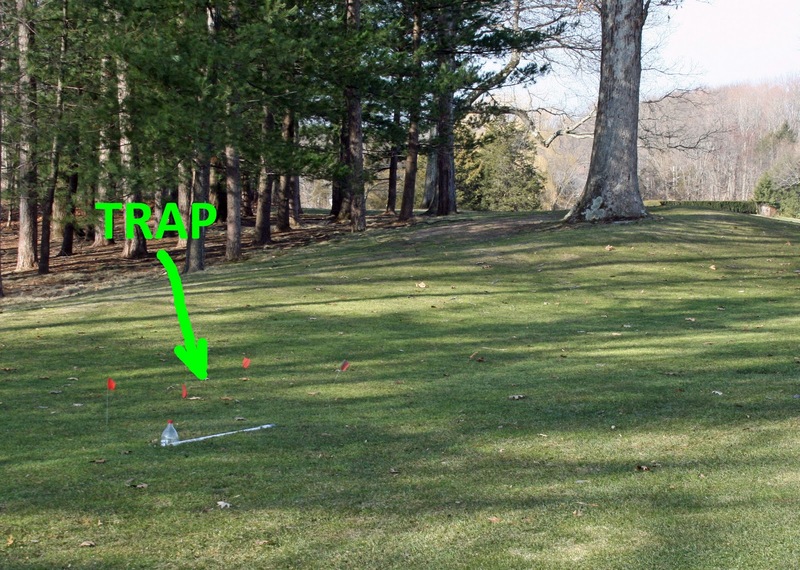 We have installed the two traps adjacent to fairways one and ten which are excellent indicator areas. These traps have already proven to be quite functional. We installed the traps on March 18th and already had trapped adults by March 21st. Our trap on hole number ten caught the most ABW adults, twenty-four! What does this mean? The timing of the movement of adults is earlier than expected. We will be adjusting the timing of our pesticide applications to improve efficacy. The improved timing should result in better control of the adults, which will reduce the amount of eggs laid. Less eggs means less larvae equaling less damage. We are hoping that the improved timing of our pesticide applications will reduce visible ABW damage while maintaining the budgeted cost for its control. Pitfall Trap on Hole #10 Caught 24 Adults in Two Days! 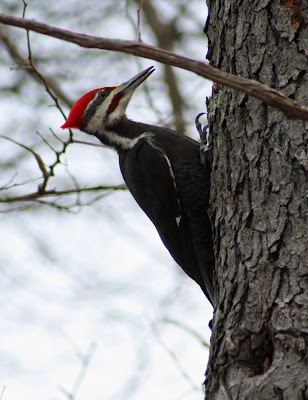 Re-Print of My CTGolfer.com Entry... Spring is Here? 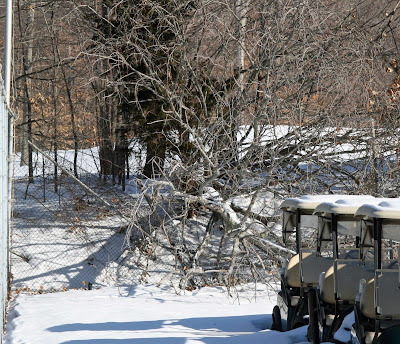 Golf courses throughout the region are trying to kick off the season, but “Old Man Winter” keeps trying to throw a monkey wrench into the plan. Cold temperatures and the occasional light coatings of snow are inhibiting turfgrass from breaking dormancy at many facilities. The calendar says spring is here but we need Mother Nature to cooperate. The recent weather pattern not only slows the opening of some courses but inhibits the superintendent’s ability to quickly improve course conditions. Golfers are chomping at the bit but must be patient. Soon enough the weather pattern will change and superintendents will be able to dramatically improve playing conditions. In addition to normal spring cleanup, many superintendents are facing the added problem of repairing winter damage to golf course greens. Varying degrees of injury have been reported throughout the northeast after experiencing one of the harshest winters on record. 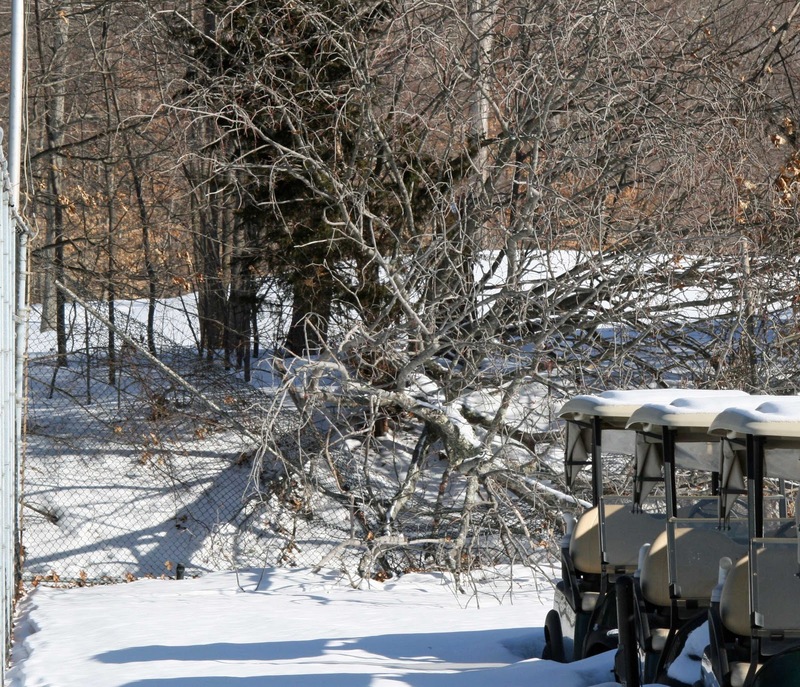 Superintendents are prepared to initiate their recovery plans as soon as weather conditions are favorable. Warmer soil temperatures are the key to successful recuperation. Aerification, overseeding and sodding of injured greens must be timed accordingly for rapid recovery. One of the toughest things superintendents will face is communicating to golfers the importance of staying off renovated areas of greens. Some holes will need to have temporary greens and some greens will simply have affected areas roped off. The worst case scenario for a superintendent is succumbing to the pressure of opening damaged areas too early. Tender young turf plants need to be “babied” until they are strong enough to support foot and maintenance traffic. Newly established turf plants must have every opportunity to mature if they are to survive the stress of summer which is only three months away. The USGA Northeast Regional Agronomist, Adam Moeller, has published a very informative video on the subject. I encourage all players and course officials alike to spend thirteen minutes viewing his newly released webcast on Winter Injury on Putting Greens in Northern Areas. 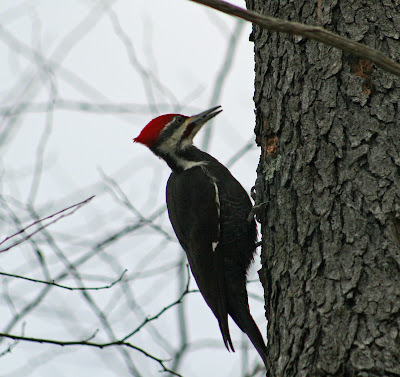 I was lucky enough to catch a few pictures outside the maintenance facility yesterday. 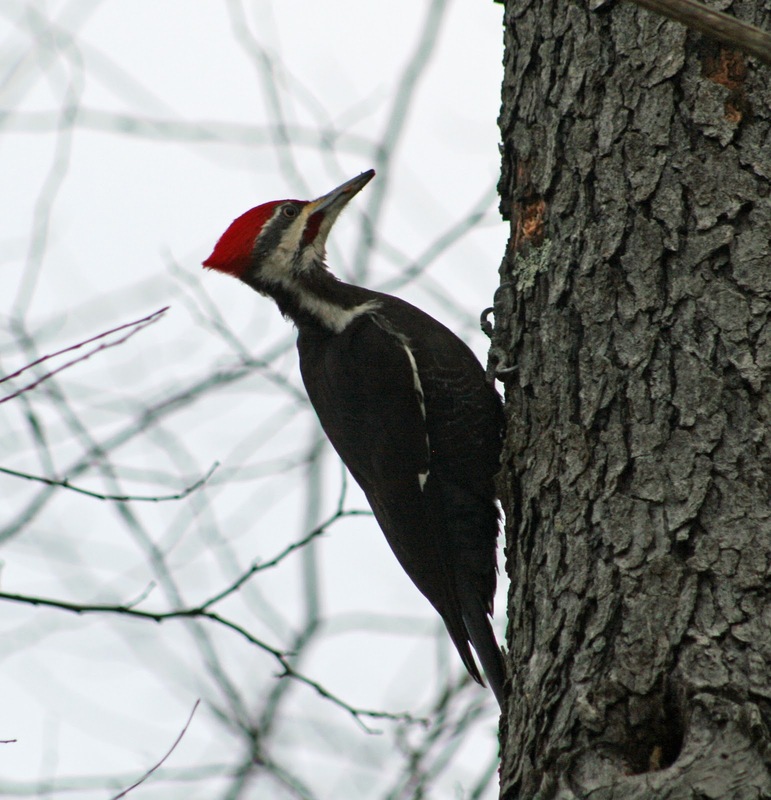 Description: The pileated woodpecker is the largest woodpecker found in Connecticut (16-19 inches). 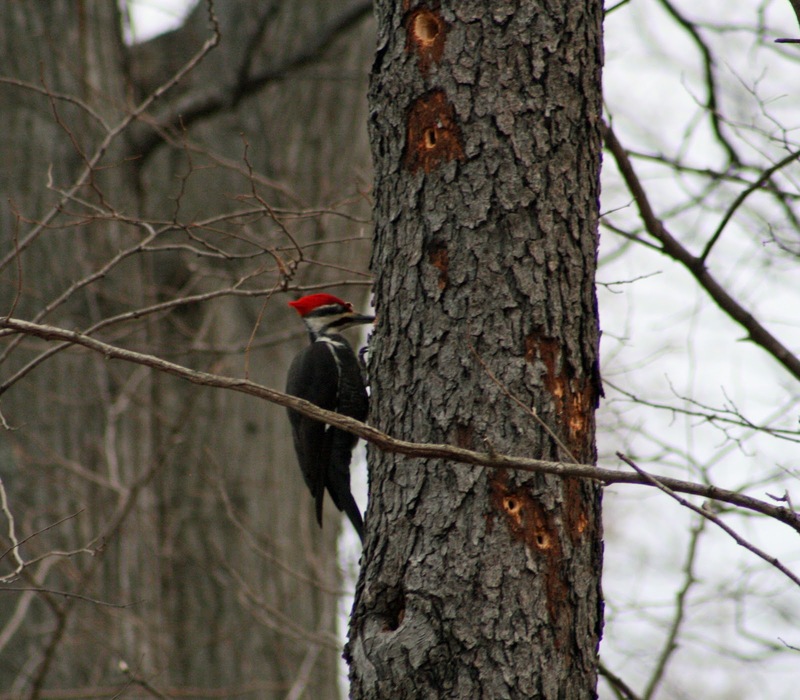 It has a solid black back and a conspicuous red crest extending from its forehead to its nape. 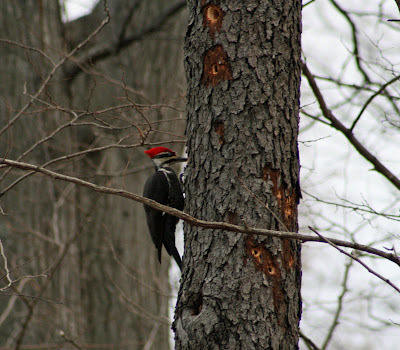 Males are larger than females and they have a red forehead, red crest, and scarlet mustache. 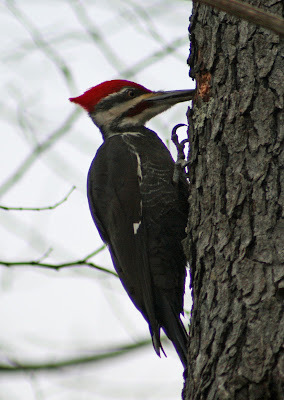 Females have the red crest but a black forehead and black mustache. 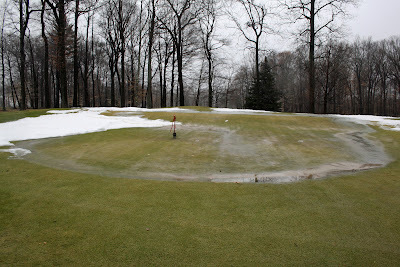 The snow and ice is melting fast and course conditions are extremely wet from the additional heavy rain. The maintenance staff used a snow blower to remove the snow from thirteen green on Wednesday. We wanted to expose the underlying ice so the warm rain could melt it. We have some turf on a few greens that looks discolored so we have taken sample plugs and brought them into the office. By warming the plugs inside they will break dormancy and we can see if there is any damage. We should know what we are facing in a few days. There has been snow mold damage to areas in the rough and fairways but nothing too significant. It may look bad but generally grows out after the turf breaks dormancy. Greens and tees are going to remain closed until the ground firms up enough to support foot traffic. Walkers can tee the ball up in the rough and play the temporary greens. Please refrain from walking on any tee or green surface. You will cause damage to the turf! Re-Print of My Blog Entry on CTGolfer.com. Ice Layers on Greens! 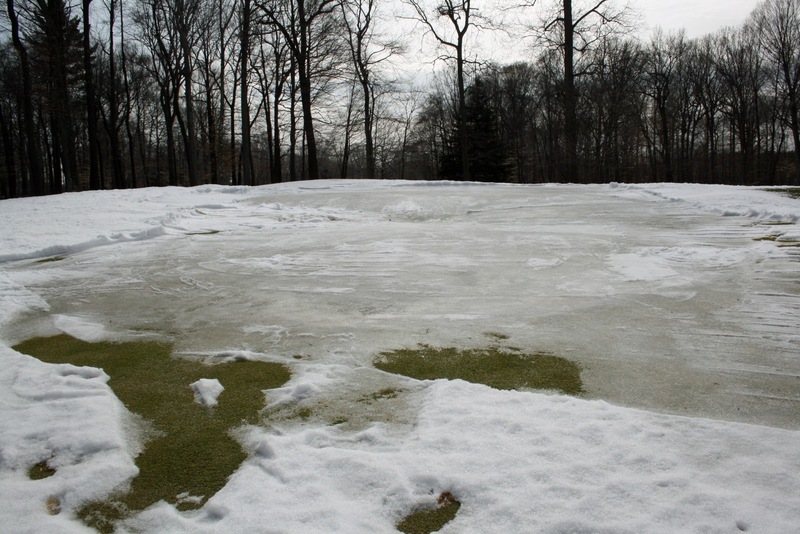 I’ll be attending the New England Regional Turfgrass Conference in Providence, Rhode Island this week and guarantee the hot topic will be ice layers on greens. Guest speakers, superintendents and industry professionals will share every tidbit of information they can to help each other get through the next few weeks of critical course management decisions. 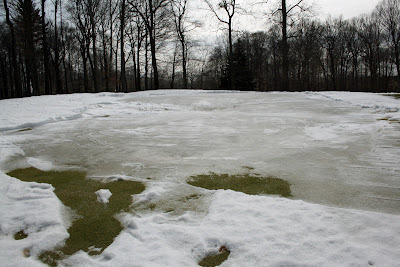 When an Ice layer forms directly on a green’s surface, the turf beneath is sealed off from the air exchange necessary for its survival. 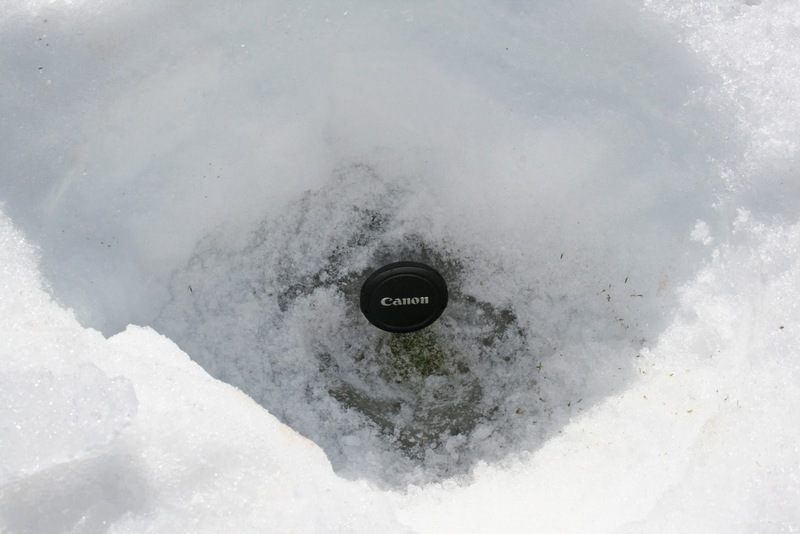 Carbon Dioxide and other toxic gases build up under the ice and Oxygen is slowly depleted (anoxia). 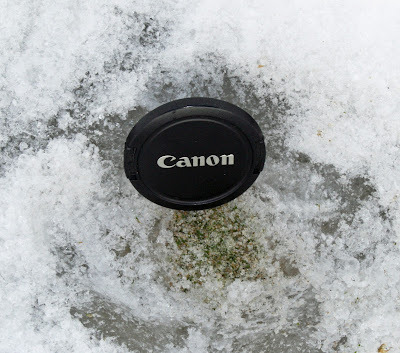 If the ice doesn’t dissipate within a certain amount of time, turf damage can occur. In the Northeast, we are concerned with two species of turfgrass on greens, Poa Annua (Annual Bluegrass) and Creeping Bentgrass. 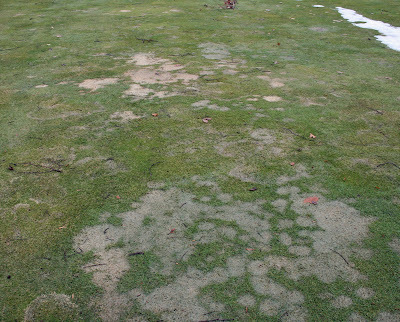 Poa Annua is the most susceptible to this type of damage. After an estimated forty days, anoxia may kill Poa Annua. Creeping Bentgrass is genetically more resistant and may not be affected until ninety days. Notice my careful choice of words. 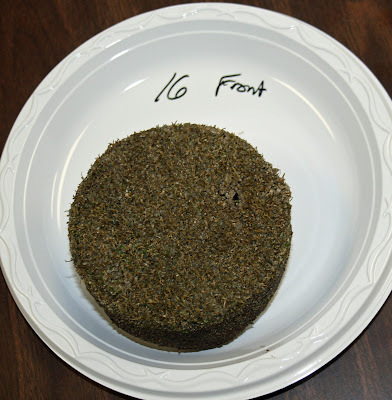 There is no exact formula to predict the death of either variety of turfgrass. 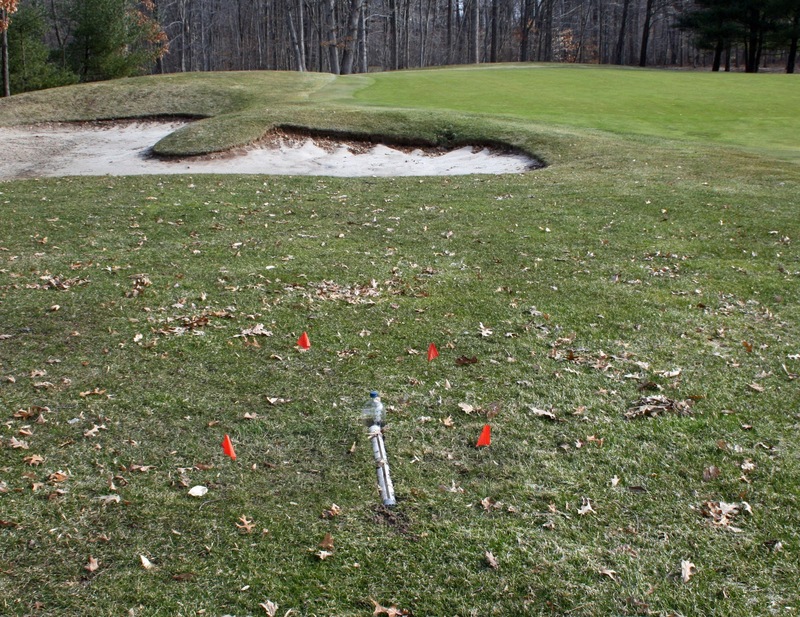 Superintendents rely on their own experience, course conditions, university studies, peer experiences and every other morsel of information available to them to make the right decisions in preventing damage to their course’s greens. To further complicate the issue, the extreme variations in conditions from course to course, within a single course or on one green, make it impossible to analyze this subject in “black and white”. 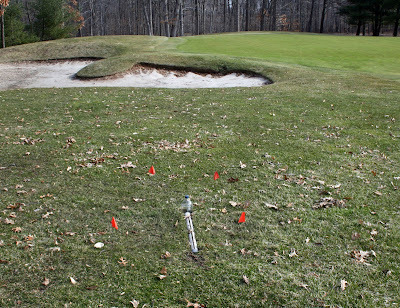 The differences in climate, soil type, turfgrass species and management techniques make every courses situation unique. Superintendents are faced with making difficult decisions without a solid foundation of facts to support them. 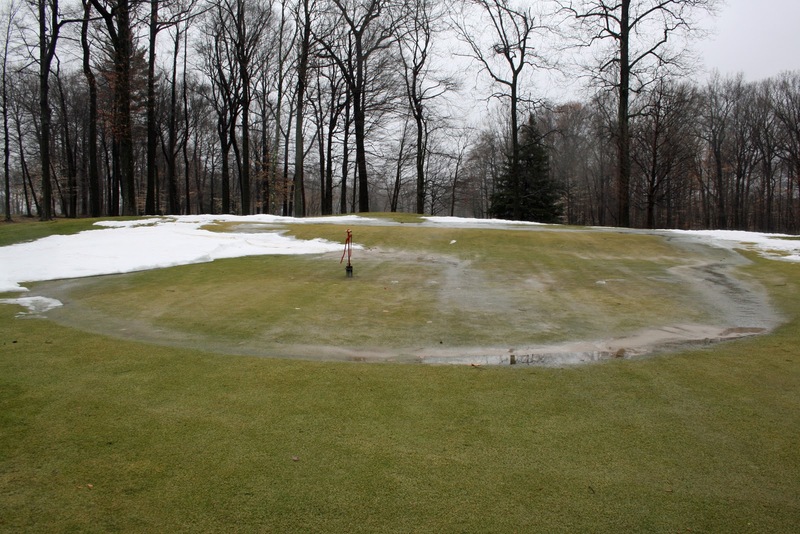 The big question is if superintendents should try to remove the ice layer and when. Successful results and methods are spotty at best. I’ve seen courses have success with snow removal using snow blowers, heavy equipment and dark colored topdressing materials. I’ve also seen those same techniques cause more mechanical damage than if nature was left to take its course. Here is one last fact to complicate the issue. If the snow and ice have been removed and the turf is exposed, it is now susceptible to extreme fluctuations in temperature because there is no insulating blanket protecting it. After a couple of warm days the turf starts to absorb water and break dormancy. Cell walls get thinner and it is now susceptible to a drastic drop in temperature. Two or three days where temperature reaches fifty degrees then a night that drops into the teens can spell disaster. Welcome to March in New England! We can’t all be as lucky as my old friend Eric Morrison, the superintendent at Shennecosset Golf Course in Groton, CT. His course is already open! I was able to take a thorough tour of the course today and check for more tree damage and measure ice thickness on greens. 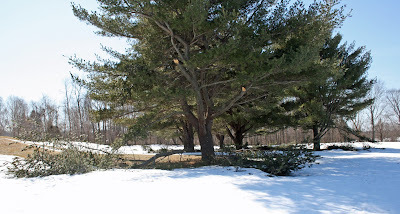 Tree damage has been mostly contained to our white pines in the form of broken branches. We did have a couple of perimeter trees that fell during the winter and caused minor fence damage. Most significantly, a tree fell across the north side fence of court #5 at the tennis facility. While tree damage has been more than average this winter, no major damage was sustained and our feature trees look good. Cleanup will begin as soon as ground conditions allow. Once the snow and ice have dissipated, I expect ground conditions to be very soft. Soft ground conditions will likely inhibit cleanup and the eventual opening of the course. Looks like we are still a few weeks away.